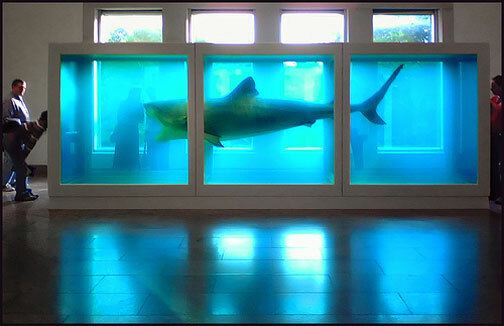 An artist of great extravagance , Damien Hirst’s memorable works through his illustrious career have included a $100 million diamond encrusted skull and formaldehyde preserved sharks. With the changing art landscape, Damien Hirst attempts to strike a balance between his involvement with galleries and the sale of art via auctions with 223 pieces of art produced between 2007 and 2008 and valued at £65 million (approximately $121 million USD) set for the auction block on September 15th and 16th via Sotheby’s London. Based on previous experiences, Hirst had this to say regarding the auction route, “After the success of the Pharmacy auction, I always felt I would like to do another auction. It’s a very democratic way to sell art and it feels like a natural evolution for contemporary art. Although there is risk involved, I embrace the challenge of selling my work in this way. I never want to stop working with my galleries. This is different. The world’s changing, ultimately I need to see where this road leads.” Among the pieces, four of them will be sold to benefit the following charities, The Demelza, Hospice Care for Children, Survival International, Strummerville and Kids Company, with each hoping to rake in between £400,000-600,000 each (approximately $750K USD – $1.1 million USD). The whole list of art can be seen over at Sothebys.com. A small menagerie of new Damien Hirst pickled animals took a bow yesterday, including a new shark, a zebra, a calf with solid gold horns and hoofs valued at up to £12m, and even a unicorn – a white foal fitted with a resin horn… All have been churned out by his small army of assistants this year for an auction at Sotheby’s in September which will sell more than 200 pieces. 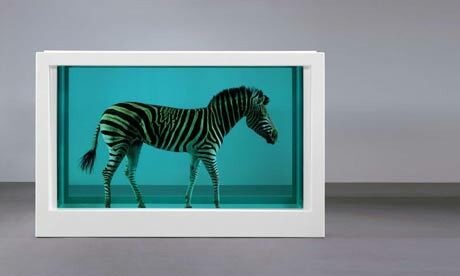 The auction is predicted to raise £65m. Sotheby’s London will present Beautiful Inside My Head Forever, a major auction of new works by Damien Hirst, on the15th and 16th of September 2008. Beautiful Inside My Head Forever is an historic sale which incorporates an extraordinary range of works by Mr. Hirst, all created over the past two years. From monumental formaldehyde sculptures to new paintings which expand on the artist’s classic themes such as butterflies, cancer cells and pills; from exquisite new cabinets to insightful preparatory drawings, the works in the sale document the full breadth of the artist’s creative output. 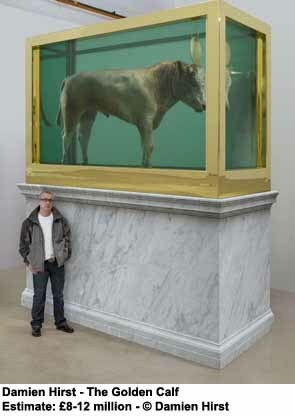 Coinciding with the 20-year anniversary of the celebrated Freeze exhibition curated by Mr. Hirst in London, which launched the careers of Hirst and his contemporaries, the auction affirms Hirst’s position as a boundary breaker; one who has never been just an artist working in the traditional vein. Beautiful Inside My Head Forever follows the now legendary Pharmacy auction, organised by Sotheby’s in 2004, which raised £11.1 million. The auction attracted an unprecedented number of bidders, many of whom spent hours queuing before the sale, eager to bid for a work by the UK’s leading 21st-century artist. The centerpiece of the auction, The Golden Calf, is a monumental new sculpture: a bull in formaldehyde, whose head is crowned by a solid gold disc and whose hooves and horns are cast in 18- carat solid gold. Encased in a gold-plated stainless steel and glass box, it measures 215.4 by 320 by 137.2 cm. This exceptional work, which unites the artist’s interests in science, religion, beauty and death, is estimated to realize £8-12 million. 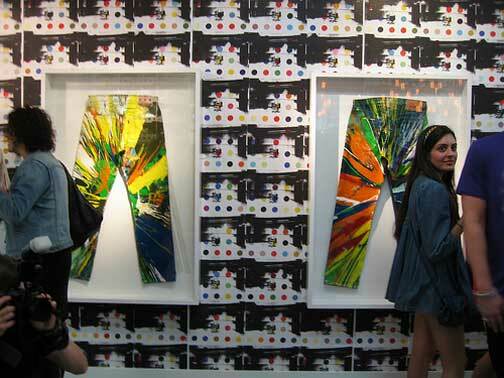 In this post-Postmodern world of branding collaborations as high culture, one would be hard pressed to find a more bankable teaming than UK art star DAMIEN HIRST, necrotic Pop Art master ANDY WARHOL, and American denim stalwarts LEVIS, a fact clearly evidenced by the turnout for Saturday nite’s collection debut at Santa Monica’s FRED SEGAL. The brand brought new life to their Warhol license by double collabing with modern Pop master Hirst, whose diamond skull and color dot motifs dominated the largely monochrome collection, often mingling with and overlaying Warhol’s vintage graphics on an array of T-shirts, denim (including the unfortunate pair of rhinestone-studded men’s jeans), and accessories. The high (or was it low?) 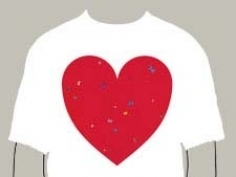 point of the collection was Hirst’s custom-made spin art jeans available for a reported $80K per pair that sent the faithful into palpable envy frenzy. The admittedly beautiful hardcover catalog accompanying the event was worth the haul out to the beach and is available at the installation for a limited time. Damien Hirst sets auction records for sales of his own work, but he has also been setting auction records for the work of other artists. 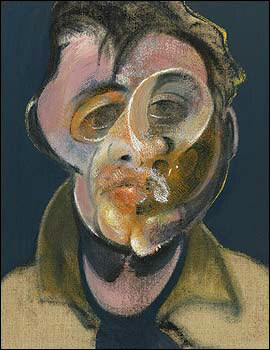 At a Sothebys auction last week Hirst was an anonymous phone bidder on a small Francis Bacon self portrait. The final price for the 1969 painting was $33 million or £15.9 million. Francis Bacon would easily be one of my top 20 all time favorite artists, but I don’t think he hit the target with every painting. I think this Bacon self portrait is one that didn’t quite hit the mark and it doesn’t deserve to be a record setting (small) work by Bacon. 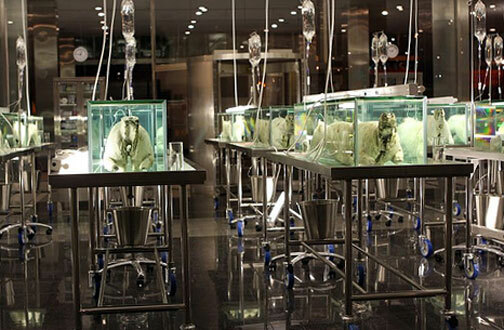 Art & Fashion – Damien Hirst shows in Prada’s NYC Flagship Store. In collaboration with Prada for New York Fashion Week Spring 2008, Hirst transformed their SoHo flagship store into an overtly graphic funhouse, using wallpaper, digital projections, and window decals to cover the upper level of the store in an infectious pattern of visual symbols. Weaving a motif of skulls and timepieces throughout, Hirst alternated his 2-D design with pills, hourglasses, coo-coo clocks, praying hands, and hazard symbols resulting in his signature rambunctiousness. The store’s stairs and sunken lower level were cleared of high-end merchandise to make way for a late night concert by British rockers, The Hours. 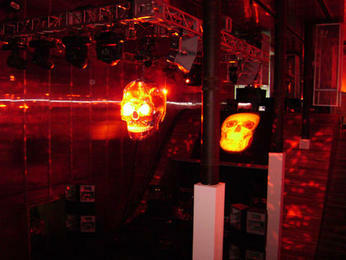 Performing under Hirst’s hanging centerpiece, a dazzling skull replete with disco ball mirrors and menacing timepieces for eyes, the event had the feeling of an exclusive art happening that would have made Warhol proud.